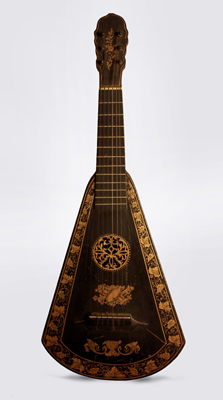 Harp Guitar, from the workshop of A. Barry, c. 1805, made in London, ebonized wood finish, ebonized plain wood back and neck, ebonized spruce or pine top, ivory frets. The harp guitar was invented by Edward Light in 1798 and made by A. Barry in London. This was the beginning of a series of instruments invented by Light which included the harp-lute, the harp-lute guitar, the dital harp (see catalog #3220), and ended with the Apollo lyre around 1825. It's called a harp guitar because of the harp-like back and the guitar-like neck. The top of this instrument is painted with gold grape vines, musical trophies, and an urn and floral motif and has a fretwork gilt rosette. The fingerboard has 12 ivory frets and the peghead has six ebony pegs and is painted with a gold floral branch. The bottom rib has an original turned ivory button. Formerly in the estate of Rose Augustine. Height is 31 1/2 in. (80 cm. ), 12 1/4 in. (31.1 cm.) width. Scale length is 18 1/2 in. (470 mm.). Some cracks in top and minor scratches. Very Good Condition.